Dielectric relaxation phenomena were observed for structured water concerned with calcium silicate hydrate (C-S-H) gel in mortar by broadband dielectric spectroscopy (BDS), in order to investigate the dependences on humidity and carbonation. Two relaxation processesdue to structured water were assigned from dielectric relaxation curves obtained in the frequency range between 1 mHz and 1 MHz. The relaxation time of each process increases with decreasing amount of water in mortar. The frequency of the absorption peak for carbonated mortar is lower than that for non-carbonated mortar. Dielectric relaxation phenomena obtained for concrete samples cored from sidewall of expressway with the curing time of 40 years indicate the three relaxation processes as well as the mortar test peaces. Dynamics of water provide important rules in physical properties and structures of various moist materials -. The principal dielectric relaxation of pure water is observed around 18 GHz at 25 °C. It is well known that the physical properties of water in aqueous mixtures are different from those of bulk water. For example, water around DNA and protein molecules is forms two-dimensional network on the surface and greatly influences structures of DNA and proteins . These water molecules directly attach to biopolymer through hydrogen-bonds and form ordered structures of the double helix of DNA and tertiary structures of globular proteins. This water is called "bound water". The absorption peak for the bound water was observed around 100 MHz at 25 °C, i.e., two decades lower than that for pure water. The dielectric absorption peak due to water included in moist materials is generally observed at lower frequency with binding and increasing degree of confinement . Fig 1: The section view of the three-terminal flat-end probe with a diameter 40mm and C0=0.55pF. We have studied curing time dependence of dielectric relaxation processes due to water in mortar . A relaxation process observed around 10 GHz after curing for one hour was due to free water. The free water is taken into C-S-H and is transformed to hydrated water by the hydration process. We call the water taken into growing C-S-H "structured water". The absorption peak of the structured water in hardened cement paste (hcp) is shifted to lower frequency with aging. The frequency of the absorption peak depends not only the curing time but also related to humidity. Then the peak was observed at the lower frequencies during dry winter in Hiratsuka (Japan) and was at the higher frequencies during rainy seasons. However, systematic measurements to clarify the humidity dependence have not been performed yet. The carbonation of mortar is also one of the most important subject because of the reduction of the strength of mortar. C-S-H reacts with CO2 in the air and CO3 2- ion in pore solution with formation of CaCO3 . Carbonation brings a specific damage to the structure of C-S-H and irreversible shrinkage . Then we expect that the carbonation should influence the relaxation process of structured water in C-S-H. In this work we performed broadband dielectric measurements to observe relaxation processes due to water in mortars with a new flat-end probe developed to the non-destructive test for solid and elastic materials. We investigated dynamics of structured water related to C-S-H structure depending on humidity and carbonation. In addition, old concrete sample cored from side wall of highway was examined as a practical test. Two samples of mortar individually prepared and a concrete sample were used for dielectric measurements. Portland cement was obtained from Chichibu-Onoda Cement Co. (Tokyo, Japan). We prepared the mortar, called "mortar A", with water/cement ratio (w/c) = 0.60 in 1999. Mortar A had been kept in laboratory for 41 months. Then after cutting out, we dried mortar A in a vacuum oven (1 torr) at 200 °C for one hour and set it in a sealed box under appropriate constant humidity. Dielectric measurements to examine the humidity dependence were carried out in a humidity range between 3 %R.H. and 29 %R.H. We estimated the amount of water in the mortar sample from a difference between the initial weight of cement and sand at the preparation and the total weight of the mortar sample, on the assumption of no bleeding and all water which has been taken in C-S-H by hydration reaction with curing. The amount of water in mortar A increased from 0.304 g/cm3 to 0.328 g/cm3 with increasing humidity. Mortar B was prepared from a mixture of the cement with fine sand as w/c = 0.45 and fine sand in 1998. Two mortar blocks had been kept in laboratory without any treatments for 42 months before cutting out. One sample was set in a sealed box under CO2 atmosphere above 40 %R.H. at 60 °C for 9 days and at 80° C for 12 days. The non-carbonated mortar has been kept in the laboratory without any treatments during carbonating another mortar. The dielectric measurements for mortar B with and without carbonation were carried out at 25 °C and 11 %R.H. A concrete sample, Mortar C, was cored from sidewall of Metropolitan expressway at Tokyo, Japan. The w/c ratio estimated by drying for the cored sample was 0.47. This sample includes coarse aggregates. Dielectric measurements were carried at 25°C and 40 %R.H. All mortar samples used in this work are listed in table 1. Table 1: Mortar samples used for dielectric measurements. Dielectric measurements were performed by LCR meter (20 Hz-1 MHz) and alternating current phase analysis (ACPA) method (1 mHz-1 kHz)  using a three-terminal flat-end probe with diameter of 40 mm and C0 = 0.55 pF as shown in figure 1. We usually observe relaxation processes below 1MHz, using a parallel-plate electrode , which requires thin plate hcp samples (2 mm). However, dielectric measurements with this electrode are not appropriate as the non-destructive test of mortar. 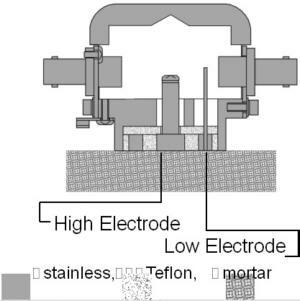 Furthermore difficulties to form complete parallel surfaces for thin mortar samples sometimes led to a large measurement error.Dielectric measurements with the three-terminal flat-end probe required no procedures, such as cutting out a piece of the sample and pulverizing hcp prepared for DTA and TGA measuremets. The probe is just touched on the fine surface of the mortar. where e¥ is limitting dielectric constant at high frequency, i is the number to indicate a relaxation process, j is the imaginary unit, s is dc conductivity, e0 is the permittivity of vacuum, a and b (0<a, b£1) are shape parameters for the asymmetric and symmetric broadening. We numbered the lowest frequency relaxation process as "process 1", the middle one as "process 2", and the highest frequency one as "process 3" as shown in figure 2. According to our previous work for the hydration process of Portland cement paste , the relaxation process due to orientation of free water was observed around 10 GHz. The relaxation strength of the free water rapidly decreased with the curing time during the first three days. Another absorption peak appears at 1 MHz in one month, and its relaxation strength slightly increased with increasing curing time. The lower frequency process at 1 MHz-100 MHz is caused by structured water in C-S-H. This relaxation process reflects hardening process of mortar in which free water is taken into C-S-H and is transformed to structured water. In addition, the absorption peak of structured water shifts to lower frequency with aging . Therefore, the relaxation processes 2 and 3 observed for mortar A are caused by structured water in C-S-H. Figure 3 shows dielectric relaxation curves for mortal A at various humidity. The two absorption peaks of processes 1 and 2 are apparently observed for the relaxation curve at 67 %R.H. These absorption peaks shift to the lower frequency with decreasing humidity. For the dielectric relaxation curves observed below 25 %R.H, processes 2 and 3 also shift to lower frequency with decreasing humidity, and the process 1 shifts to out of the lower frequency limit of the present measurement. The existence of two relaxation processes 2 and 3 indicates that the mortar involved at least two different kinds of structured water. Process 1 is observed around frequencies three decade lower than that for process 2. Precise measurements on the process 1 have not been performed yet, and the relaxation mechanism is not discussed in the present report. Fig 2: Dielectric relaxation processes for Mortar A at 25 °C and 67 %R.H. The lines are obtained from curve fitting with equation (1). Fig 3: Dielectric relaxation processes for Mortar A in various relative humidity at 25 °C. Figure 4 is the water amount dependence of each relaxation time for processes 2 and 3 for mortar A. The relaxation time of both processes decreased with increasing water amount, i.e., increasing relative humidity. Despite a difference of less than 10% in the water amount, the relaxation times of processes 2 and 3 increased one hundred times. This result implies that dynamics of structured water are remarkably restricted with decreasing amount of water. Fig 4: Water amount dependence of the relaxation times for processes 2 and 3 of Mortar A. Filled and open circles indicate processes 2 and 3. The dielectric spectra at 25 °C and 11 %R.H. for carbonated and non-carbonated mortar B are shown in figure 5. Though the both mortar samples had been kept in the same humidity, the peak frequency for carbonated mortar B is lower than that for the non-carbonated mortar. Furthermore, the water amount for carbonated mortar was 0.05 g/cm3 less than that of non-carbonated mortar at 11 %R.H. This result indicates that the carbonation removes the water from the structure of C-S-H. However, effects of chemical dehydration by carbonation and physical dehydration by heating have not been enough clarified treated yet. Additional information from more systematic experimental data for the carbonation process is necessary. Fig 5: Dielectric relaxation processes for mortar B at 25 °C and 11 %R.H. Filled and open diamonds indicate carbonated and non-carbonated mortar samples. Fig 6: Dielectric relaxation curve for the cored concrete of a sidewall of expressway at 25 °C and 40 %R.H. Figure 6 shows dielectric relaxation processes observed for concrete cored from sidewall of expressway, mortar C, at 25°C and 40 %R.H. The relaxation curve was described well by the superposition of three dielectric relaxation processes 1, 2, 3 and a contribution of dc conductivity. The absorption peak for process 2 observed around 10 kHz, is not lower than those for mortars A and B, even if curing time for the mortar C is much larger. This result indicates that the structure of C-S-H in older mortar C was similar to those in the newer mortars. In this case of the mortar C, the humidity (40 %R.H. ), in which the sample had been kept before dielectric measurements, should dominate the relaxation time rather than the effect of aging. The amount of water is considered to affect dynamical structures of structured water. However, we don't understand whole of water structure in concrete, since details such as the distribution of the relaxation time have not been determined yet. Sudo, S., Shinyashiki, N., Kitsuki, Y., Yagihara, S., Dielectric Relaxation Time and Relaxation Time Distribution of Alcohol-Water Mixtures, J. Phys. Chem. A., 2002, 106, 458-464. Shinyashiki, N., Yagihara, S., Comparison of Dielectric Relaxations of Water Mixtures of Poly(vinylpyrrolidone) and 1-Vinyl-2-Pyrrolodinone, J. Phys. Chem., 1999, 103 (21), 4481-4484. Hayashi, Y., Miura, N., Yagihara, S., Molecular Dynamics of Hinge Bending Motion of IgG Vanishing with Hydrolysis by Papain, Biophysical Journal, 2000, 79, 1023-1029. Yamada, G., Hashimoto, T., Morita, T., Shinyashiki, N., Yagihara, S., Tokita, M., Dielectric Study on Dynamics for Volume Phase Transition of PAAm Gel in Acetone-Water System, Trans. Mater. Res. Soc. Japan, 2001, 26(2), 701-704. Miura, N., Hashimoto, T., Goto, M., Hayashi, Y., Shinyashiki, N., Yagihara, S., Shigematsu, T., Shioya, S., Nishida, H., Dobashi, T., Yoshii, F., Dielectric Study on Various Aqueous Gels of Polysaccharide, Trans. Mater. Res. Soc. Japan, 2002, 27(3), 573-376. Kita, R., Kaku, T., Ohashi, H., Kurosu, T., Lida, M., Yagihara, S., Dobashi, T., Thermally induced coupling of phase separation and gelation in an aqueous solution of hydroxypropylmethylcellulose (HPMC), Physica A, 2003,319, 56-64. Naito, S., Hoshi, M., Yagihara, S., Microwave dielectric analysis of human stratum corneum, Biochim. Biophys. Acta, 1998, 1381, 293-304. Hayashi, Y., Miura, N., Shinyashiki, N., Yagihara, S., Mashimo, S., Globule-Coil Transition of Denatued Globular Protein Investigated by a Microwave Dielectric Technique, Biopolymers, 2000, 54, 388-397. Mashimo, S., Kuwabara, S., Yagihara, S., Higasi, K., Dielectric Relaxation Time and Structure of Bound Water in Biological Materials, J. Phys. Chem., 1987, 91 (25), 6337-6338. Nelson, S., Forbus, Jr., W., Lawrence, K., Permittivities of Fresh Fruits and Vegitables at 0.2 to 20GHz, J. Mcrowave Power s Electromagnetic Energy, 1994, 29, 81-93. Yagihara, S., Miura, N., Hayashi, Y., Miyairi, H., Asano, M., Yamada, G., Shinyashiki, N., Mashimo, S., Umehara, T., Tokita, M., Naito, S., Nagahama, T., and Shiotsubo, M., Microwave Dielectric Study on Water Structure and Physical Properties of Aqueous Systems Using Time Domain Reflectometry with Flat-End Cells, Subsurface Sensing Technologies and Applications, 2001, 2(1), 15-29. Miura, N., Shinyashiki, N., Yagihara, S., Shiotubo, M., Mictowave Dielectric Study of Water Structure in the Hydration Process of Cement Paste, J. Am. Cerm. Soc., 1998, 81, 213-216. Yagihara, S., Shinyashiki, N., Hayashi, Y., Asano, M., Shiotsubo, M., Kato, Y., Uomoto, T., Arino, M., Tokunaga, T., Noto, K., Tsuda, S., and Kimura, W., Non-destructive testing in civil engineering 2000, Amsterdam, Elsevier Science, 2000, 79-86. P. Kumar, Paulo J. M. Monteiro, concrete, 2nd ed, Prentice-Hall, Inc., 1993. H. F. W. Taylor, cement chemistry, 2nd ed, Thomas Telford Publishing, London, 1997. Hayashi, Y., Asano, M., Shinyashiki, N., Yagihara, S., Shiotsubo, M., Kato, Y. and Uomoto, T.,Dielectric Measurement for Mortar: Curing Time Dependency of Relaxation Spectra of Hydrated Water and Non-Destructive Test, Proceedings of Fourth International Conference on Electromagnetic Wave Interaction with Water and Moist Substances, 2001, 243-250.